Rebel Legion - Built on hope. Hi all, just finished my Endor commando costume for the "for the love of sci fi" con. Here's a couple of photos, looking for refinements and feedback. Building/sourcing a blaster next, any advice appreciated. Are there any laces on your gaiters? These should be to the front. Do you have a preference for what sort of blaster you want to add? The standards offer a good choice of E-11, DH-17 or A-280 (Endor version). At first look, it's a very good baseline you have to work off there. Some parts look great but there are some points that I'd pick up on. Please don't hesitate to ask if you have any questions or need anything explaining or illustrating, I'm happy to help wherever I can. You donut looks good, presuming you have stripes or vents on the back. The duckbill/peak on the flight cap might look a bit big but it's not easy to judge with a frontal aspect only. I like the bandolier, I'd like to think that won't be an issue, plus it is optional but I think it adds to the overall look. Gloves and boots seem good, I think the boots have the toe cover and they can both be weathered a bit if you wish. I can't see a belt with pouches, they're required. I used olive drab 58 pattern stuff that's easy to pick up. The gaiters seem a decent shape, but we can't see the lacing. I think we've touched on the 5-8 eyelets previously but they look a bit grey and not tan. Is that the lighting? There are references with laces on the front or back of the gaiters. Dressing on set wasn't uniform but in general we do lace to the front. The undershirt looks fine, if it's long sleeved, even if they're never seen. You've gone for a soft pack, which seems olive. We mostly have Czech ones that are more khaki than olive, with an arc of pond hose. This is an optional item again and the standard isn't definitive about colour. A blaster is a required item. E-11s are probably easiest to get, resin ones are heavy to carry all day and are brittle but look best. There are toy conversions available of those that are much lighter and look OK. I by far prefer the A280 for the ERT though, I made one from PVC pipe, styrene sheet and a BB M16 receiver. 3d printed E-11s or DH-17s are worth looking into otherwise. Over time, we've developed a list of the colours that work for this and are available in the UK so we look do look similar if we are together in a group. Overall, I think you're off to a great start with some of the tricky parts well covered. Good work there. Happiness is a warm A280. Or A300. Even a Glie-44 at a pinch. Thanks for the feedback, I have an E-11 blaster at the moment (in my pack in the photos). 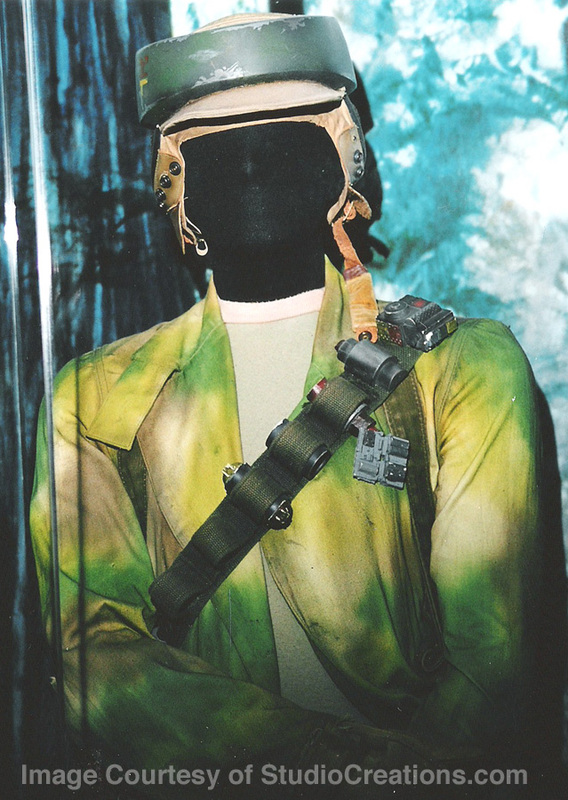 Once the costume is completed I will be looking to build an A-280 (endor version). The gaiters have six brass eyelets with green paracord laces (at the rear in these photos though). Noted, at the front next time. Pleased with my first attempt and looking forward to refinement! The doughnut was from Ross at RWA so very happy with it, it has vents on the rear cut out of matt black vinyl and stuck on. The softcap and peak came from 20eyesdesign on etsy, it came late so I didn't have too much time on it but I would agree, I think the peak is a little large. Ross included a plastic formed peak with the doughnut kit which is a little smaller so I think I will cover and use that. Boots are rubber toe, Israeli type, both the gloves and boots had a little weathering but could definitely do with some more. I have an olive belt on with a couple of US ammo pouches on. I am very pleased with the bandolier, its made of material to measurements listed on the studio creations guide and the greebs themselves are from TK560. Undershirt as you say, I think looks ok, its military issue and long sleeved. The pack is a Czech soft pack, hose fitted but no other greebs on the buckles as yet. It needed a wash when I got it but lost some of its colour in the process so I dyed it olive, which turned out to be quite dark. I might give it another wash and see if it will lighten up. 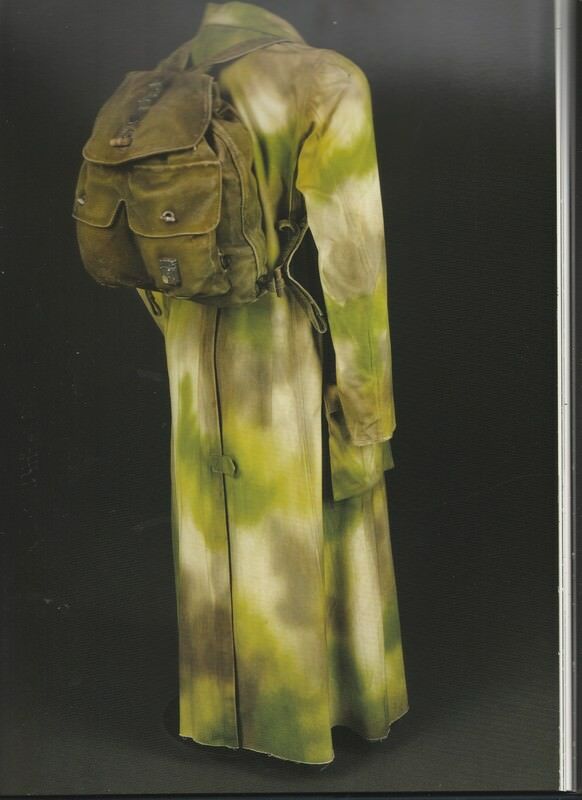 The trench coat and trousers did end up quite green, both the trousers and coat were quite a light khaki to begin with so perhaps doesn't show up as much and the green dominates? I know the list of colours originally used are all shades of green but has anyone ever added detail with a khaki spray to compensate or am I better off starting again? The trousers wont be an issue but the coat was a pain to make as I'm quite tall, if so I might consider a snow jacket style instead? Thanks for the fedback so far, I will get some detailed photos of it all laid out and in natural light for better clarifcation of colours. PS... do you have that list of colours available in the UK? I roughly colour matched with Halfords sprays. Base: Dylon Sandy beige. Pebble beige is a bit too much caramel. A decent amount of this base colour should be visible, if you compare to the reference pics, 25-30% sometimes. Main colour: Oasis Floral Basil. Lighter olive in the pics. Secondary colour: Oasis Floral Moss. Dark olive in the pics. Heavy and light coverage gives a variation in both these colours. Third level colours: Oasis Floral Hunter Green and Holiday Green in occasional patches. The front and back shots of the duster show how the Basil and Moss form the base of the pattern. You might be able to wash the bulk of the colour out of the duster but getting a cheap Swedish snow jacket is also a clearable option. That gives you time to look at the duster if it can be bleached or solvent cleaned. Picked up a new Czech backpack, better condition than the one I had previous, are the couple of greebs on the pack required for clearance? If not is the pack good to go? That's a good one, just like what I have. The pack in itself isn't needed for clearance, it's listed as an optional component. You've done a good job with the hose already so I don't think the greebs would cause a problem and they're easy to fit later on. I've got the 3d print files for them from when I did mine if need be. There are no details given in the standard for the pack yet on the other hand the greebs add that little touch of authenticity. I would say you can submit without them, I think I did and then fitted them afterwards as they're easy to get and apply once they're painted. I picked up a Swedish army snow jacket, right chest size but the sleeves are pretty short, anyone else found that or is just me? Are there any issues with sleeve length or is a turned up sleeve just below the elbow ok? If not might have to un-stitch the sleeves and make new longer ones. My snow jacket also might have shorter arms than such a chest size might expect but that could be down to it being meant as a quick cover to be put on over other things. It is also needed to be about waist length and not lower with a draw string but that's a pretty easy change. Around the middle of the belt is a good length to aim for. How short in the arm is it? Does it reach near the gloves?